As soon as Aamir Khan posted the motion picture of Thugs of Hindostan on his official Twitter account, Amitabh Bachchan’s epic looks as Khdabaksh went viral over the internet. Haven’t seen the first motion poster yet? Well, check it out know and get amazed by Amitabh Bachchan’s fierce looks in that poster! The epic action-adventure film “Thugs of Hindostan” is directed by Vijay Krishna Acharya which is actually based on the novel “Confessions of a Thug”. This film is starring Amitabh Bachchan, Aamir Khan, Fatima Sana Shaikh, Katrina Kaif, and Ronit Roy. This film is going to be released on 8 November this year. 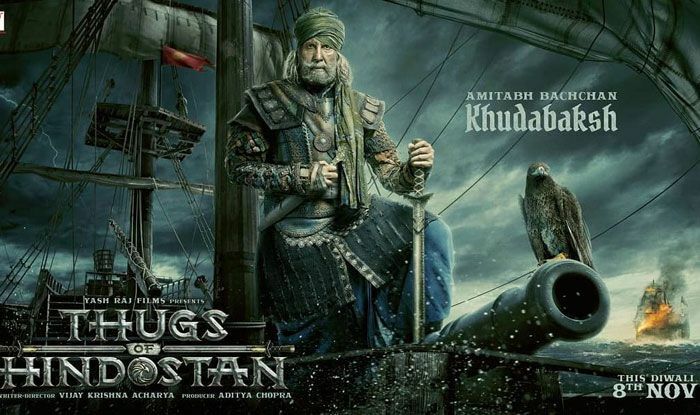 Superstar Amitabh Bachchan is playing the character of Khudabaksh in Thugs of Hindostan. You will see Amitabh in rough and fierce attire with a sword in his left hand, metallic armor over his body, and a turban on his head. If you would look into the eyes of Amitabh, you will see his deep passion and fearless spirit clearly. Undoubtedly, Amitabh Bachchan’s attire in Thugs of Hindostan doesn’t only suits his character but also showcases his unique talent of acting! According to the novel, Khudabaksh is the leader or commander of the entire ship who is actually one of the main characters in the film. In the poster, you will see Amitabh Bachchan all set for the war in the dramatic teaser poster. Not only Amitabh Bachchan’s looks, but Aamir Khan’s attire in the film is also shocking and unrealistic. Undoubtedly, Thugs of Hindostan is going to be an epic film. But, we all have to wait for its final release till the November!